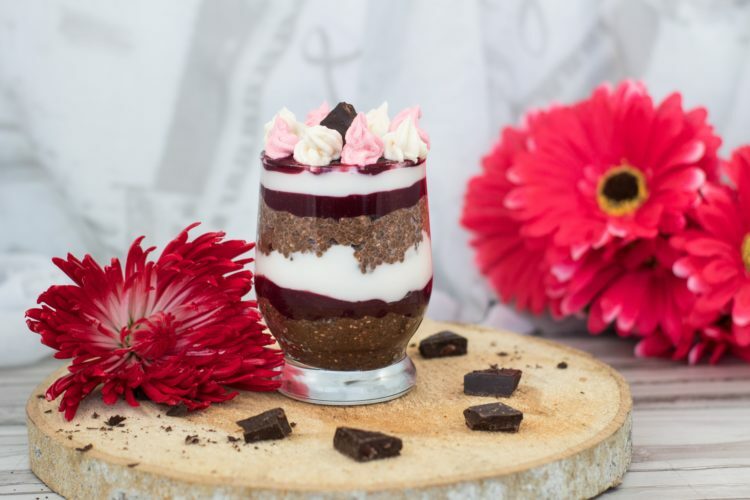 Parfaits are one of those things that are so versatile and delicious! 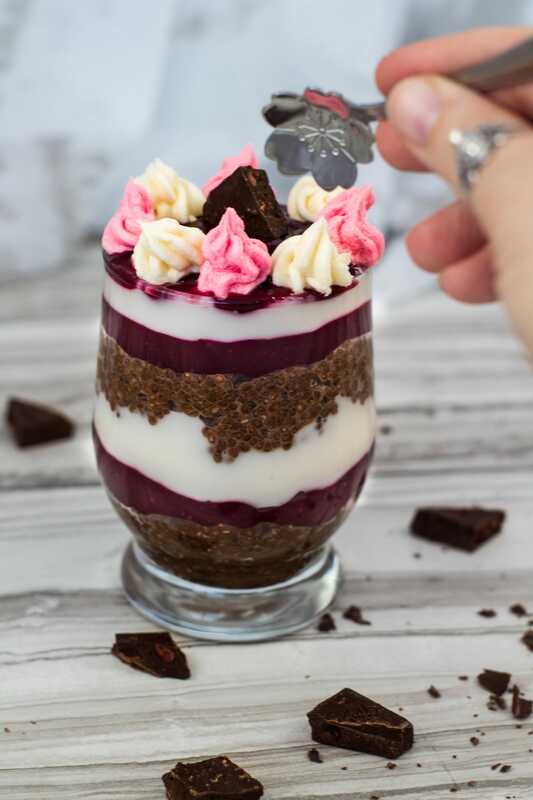 You can make them for dessert or breakfast; this parfait can be for both! Black forest cake flavors seemed to be a perfect choice to make into a parfait. Instead of cake in a layer though, I decided to make chocolate chia pudding. 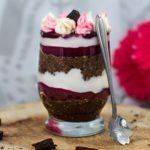 Check out my Instagram page HERE to see other parfaits I have made. Start by making the chocolate chia pudding. I used barely any sweetner in my pudding, but if you like your dishes more on the sweet side, you can add more. You do have to make sure that the cocoa powder is completely combined before adding the chia seeds so it doesn’t get lumps of cocoa in it. Refrigerate for one hour, or until it is set. Next, it’s time to start the cherry sauce. I used frozen cherries as you can’t get fresh cherries where I live in February sadly. As you can see in the picture, you simmer them until they become soft and split. 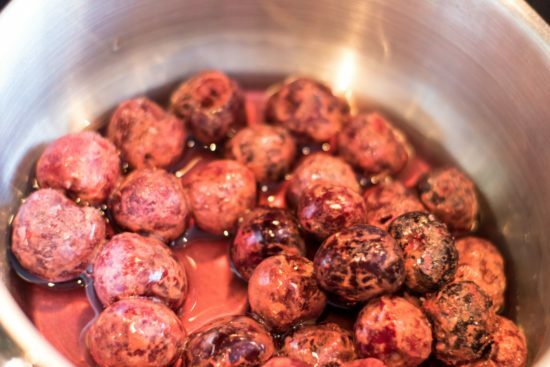 Puree the cherries until there are no chunks. If it isn’t thick enough, you can add a cornstarch slurry. 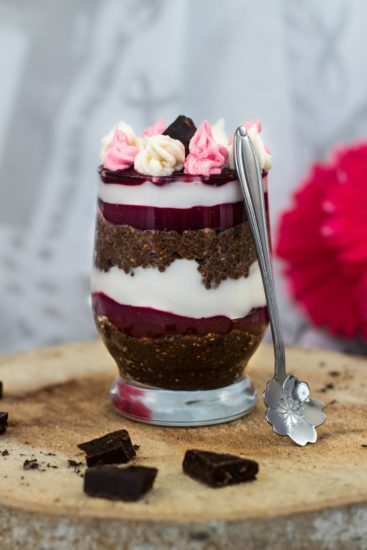 Use the chia pudding on the base and then the cherry sauce and then coconut yogurt. Repeat until the glass is full. Granola, fruit or nuts are great choices for topping this delicious parfait. Combine everything except the chia seeds. 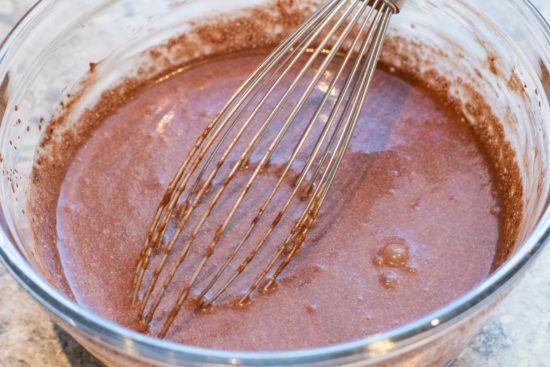 Make sure that the cocoa powder is mixed thoroughly before adding the chia seeds. Add more milk if needed. Whisk and refrigerate for 1 hour to set. Mash or puree the cherries and add the cornstarch slurry if it isn't thick enough. Let cool completely. Start with layering the chia pudding on the bottom of each container. Then top it with the cherry sauce and then the yogurt. Repeat until the containers are full. Add granola in the layers if wanted. I had this and it is amazingly good. Excellent as a dessert!